"Regardless of where the wind blows, the Hungarian government will not give up on its position." The Hungarian government will not give up on its intentions to block Ukraine's integration into the EU and NATO unless Kyiv changes its education law, the Prime Minister of Hungary Viktor Orban said on Wednesday, 15 November, in a statement posted on government website. "I assure the Transcarpathian Hungarians, that no matter where the wind blows, the Hungarian government will not back down from its position. We will vigorously defend it not only here or in Kyiv but also in the EU. And if you follow the latest developments including in NATO and the EU, you can see the signs of the principal activities of the Hungarian diplomats," said the Hungarian leader. Orban's statement came on the hills of Budapest reiterated threats to block the initiatives of Ukraine in NATO. He also reiterated the threats to block the rapprochement of Ukraine with the EU and NATO, earlier stated by the country's Foreign Minister Peter Siyarto. Hungary premier said that Ukraine's ability to join the EU is limited. "[Ukraine] wants to move towards the EU and then expects for something from the EU. 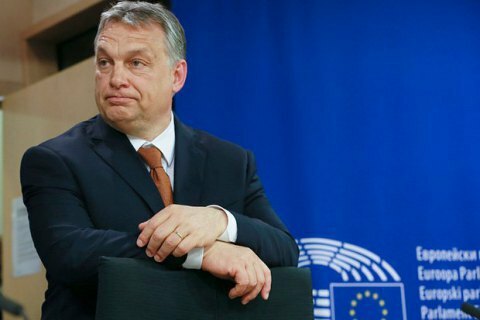 The truth is that while expecting for something from from the EU, it should accept some basic rules of the community," Orban said, calling the non-infringement of rights of national minorities a fundamental principle of the EU. "We do not accept any debate whether or not the new Ukrainian law, existing or hypothetical conforms to European norms. We do not want to be engage in this debate, because the EU has not developed standards that offer a set of objective criteria," said Orban. Orban said earlier that a positive decision of the Venice Commission on the Ukrainian law on education will not ease Budapest's claims to Kyiv. Last week, Ukraine's Deputy Prime Minister for European and Euro-Atlantic integration, Ivanna Klympush-Tsintsadze, said that NATO concerned about the behavior of Hungary in respect of Ukraine.